Imagine a small city. A place where people work, live and go to school. Where they spend their early years in kindergarten and their adult life shopping for food, chatting with friends over a coffee or letting the cat out. Any place in the world, right? Now imagine that this little city sits on water. In the middle of the ocean it is separated from land, seawater flowing beneath its every corner. The only way to get around is by boat. No roads, no cars. For this is not Venice. This is Sampela. The village of the sea gypsies. I waited fifteen years to take this trip. And finally, when I did go to the southwest part of Sulawesi in Indonesia, I met the people that I have been fascinated with since my brother told me about them in the 90’s. But when I started my research, I found that most people had never heard about these strange nomads that get ‘landsick’ when they stay away from the sea for too long. That not many in the western world knew about their existence is one thing, but even in Indonesia people looked puzzled when I asked around. Sea gypsies? They had never heard of them. 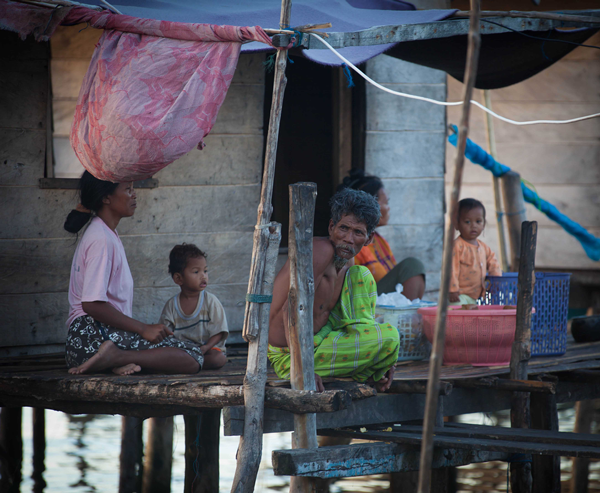 The Indonesian name for this people, or tribe is Orang Laut. People of the sea. They are not one group, but several clans. The clan I visited refers to themselves as Bajo, or Bajau. There are several other names, several other groups. And the Bajau way of thinking resonates so well with me. 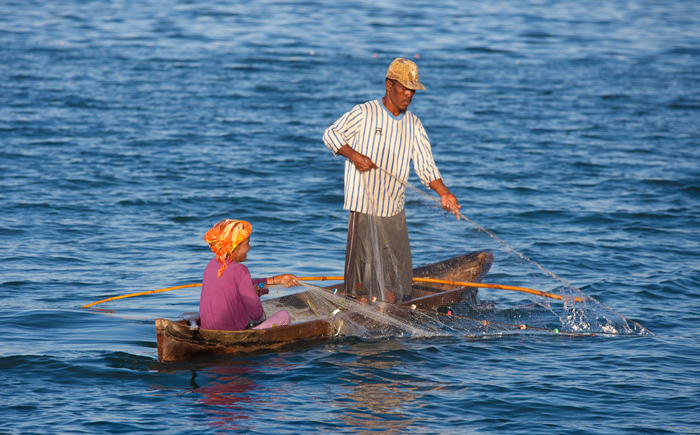 They live in close harmony with the sea, hunt what they need for the day and provide for themselves and their family. There is no hierarchy to speak of and no caste system. They have a leader, but believe that we are all equal. When I ask about their religion, a man answered: “We have a mosque, but no one uses it.” At Christmas time they celebrate Christmas, at Hari Raya, that is their reason for joining in. When they go fishing, Hantu laut, the sea spirits, might be called upon. They embrace the traditions that seem fit for the time being, not what rules others wish to lay upon them. Also, Bajau are the masters of freediving, and they are masters of spearfishing. I had the opportunity to go spearfishing with a man named Lauda. Him and his father are considered some of the best freedivers in the world and Lauda was just back from a trip to Germany where tests on his lung capacity where being done. From what I understood, BBC is doing a follow up on an earlier documentary. He and his people are unique, and in a way they are not. Seanomads can be found in many parts of South East Asia. Thailand, the Philippines, Malaysia. We just don’t hear about them too often. 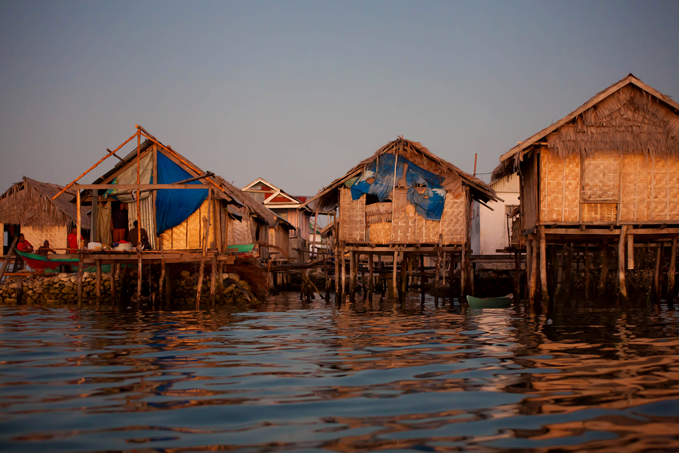 The Bajau people seem to live in peace and harmony and with a love for nature. Still, we must not forget that these are poor people. They own nothing. The sea and their surroundings are all they have and they are totally dependent on it. When storms hit the area they live in, they might be unable to catch food for several days, fresh water needs to be bought on the mainland, and medicines are scarce. In addition, overfishing now threatens the unique culture of the nomadic ocean dwellers. It is a paradise that could be lost within a few generations. Luckily, adaptation is something that Bajaus are good at. As a nomadic people they have always been driven from place to place, country to country, always finding new places to live. A people forced to flee the area when they were looked upon as an outcast that didn’t belong or someone to be afraid of. Still, Bajau has never taken to weapons, they are a peace loving people. Instead of fighting they have moved to a new area. So yes, adaptation is one of their strengths; I hope it will continue to be. Both so we all can learn more from this amazing people with their love for nature, peace and their great way of thinking. That we are all equal and that the different religions are too. But most of all I hope that we manage to protect the sea, and protect their domain and so that they can enjoy their way of life without having to compromise too much. For those who read norwegian, I have written about spearfishing with Lauda here where I have also posted a video on how the seagypsies hunt underwater. Thanks for the nice introduction to the Bajo people and a bit of Indonesia. I’m glad you liked it Wisnu! Thank you so much for brunging a bit of their story to us land-dwellers. Hope these unique cultures will be able to survive. We so much need their knowledge and the diversity in the world.